Anyone who watched the Tokyo Yakult Swallows play this past week probably still has the Tokyo Ondo stuck in their head. When they close their eyes, they might still see a sea of small, mostly green umbrellas bobbing up and down in rhythm to the tune. These are things Yakult fans do when the team scores runs, and the Swallows have been doing plenty of that lately. 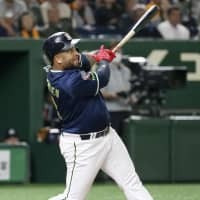 The Yakult lineup caught fire last week, punishing opposing pitchers to the tune of 54 runs over six games, more than the Hanshin Tigers (51), Chiba Lotte Marines (48), Hokkaido Nippon Ham Fighters (47), Hiroshima Carp (45) and Orix Buffaloes (41) have scored all season. Overall, Yakult, which scored a staggering 12 runs in the 10th inning against the Carp on April 10, leads NPB with 85 runs scored. It’s too early to know if Yakult only had a fortunate week or actually laid groundwork for a machine that could rival the 2018 Seibu Lions, who scored 792 runs. It took those Lions 19 games to score in double digits twice. The Swallows just did it four times in a week, putting up 10 and 15 against the Carp and twice scoring 11 against Yomiuri. Seibu rode its offense to the pennant last year, a roadmap Yakult could possibly follow. It was only six games, but the Swallows should still be enthused by the contributions from outside their core stars. That includes promising young infielder Munetaka Murakami, who had a three-hit night, including a homer, against the Carp on April 9. He also had hits in all three games against Yomiuri, including a tiebreaking homer in Sunday’s win. “His batting average isn’t high, but he’s showing a knack for hitting home runs,” manager Junji Ogawa told reporters. The second-year player is only hitting .192 overall (he hit .269 last week), but has three homers already. “I’m going to do my best to keep contributing to the team in the future,” Murakami said. In addition to the hitters, Yakult’s relievers allowed just two runs in 23 innings last week. “It’s an offensive battle, you just gotta do your best to keep the ball down,” reliever David Huff said the mindset he’s pitching with. “Make them pound it into the ground or don’t let them get extended. You get that strike one and then expand and make them look out over or reach for something off the dish. Or pound them in and get them sped up in, and then (throw) something away. Just any type of those combinations. A good bullpen is a luxury the Lions didn’t have last season. Relief pitching was a big part of the Swallows’ run to the pennant in 2015. So continued production there would be a big boost during the inevitable lean periods at the plate. 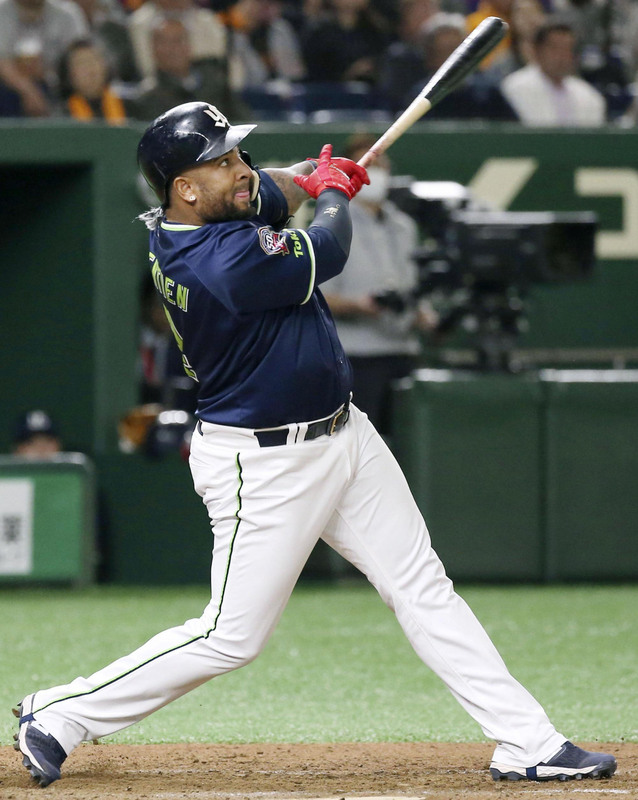 Those cold spells will come too, as evidenced by the way the Hanshin Tigers held down Yakult in their season-opening series and the control Giants ace Tomoyuki Sugano displayed over the Swallows on Friday. Balentien wasn’t ready to say the team had the top lineup in the CL yet, but didn’t sell Yakult short either. “I mean, the Giants have a great lineup,” he said. “They have power from top to bottom. Yokohama has a good hitting team too. Lately, though, the big guns have been leading by example. This past week saw the team’s Nos. 3-5 hitters Tetsuto Yamada, Balentien and Yuhei Takai combine for five homers and 25 RBIs. Norichika Aoki has also been coming up with big hits out of the No. 2 spot. “It’s not just us three, it’s the whole team,” Balentien said. “Everybody is doing a great job. Aoki gets on base and makes things go and Yamada, like always, is a great hitter. I’m coming along right now, my swing is getting better and I feel better and more comfortable in the batter’s box. Yuhei has started getting hot too.